Cloisonné is an ancient metalworking technique that was first developed in the Near East, before spreading to the Byzantine Empire and from there along the Silk Road to China, where it was then imported to Japan. Thin strips of wire were soldered to a metal body and the voids (cells or cloisons) were filled in successive stages with liquid enamel, fired hard. The vessel was then ground down and polished to reveal the final detailed effect. 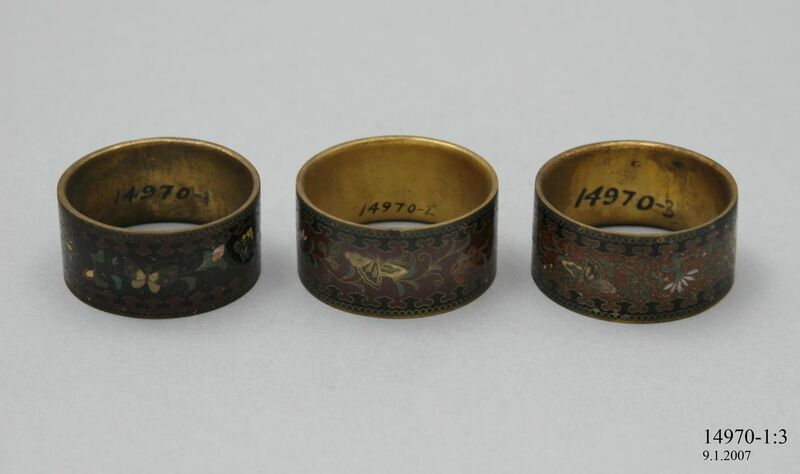 Group of three cloisonne napkin rings decorated with a band of butterflies and floral motifs on black and maroon backgrounds. The interior of all the napkin rings are plain and have not been enamelled. Cloisonne is a multi-step enamel process used to produce jewellery, vases and other decorative items. The process of cloisonne is quite complex. It first involves the artist forming the metal into the shape of the finished object, then using a paper pattern and a pencil to transfer the design to the metal object. After this partitions that act as colour-separators are applied according to the transferred pattern and are held in place by a soldering paste. The partitions are bent and cut to length from flat wire stock (usually by hand using simple pliers) while the paste is applied using a small brush. The metal piece is then heated in an oven which permanently affixes the partitions to the base metal by melting the solder, before it is cooled. Frit (glass crushed to a powder) in a water based paste is painted into the partitions using an annotated pattern. After the frit has dried, firing in an oven melts it onto the metal. Several repetitions of the process may ensue to build up the coatings to the height of the partitions. Various colours and transparancies may be used in combination within a single partition to obtain the desired artistic effect. Then the glass and a portion of the cloisonnes are ground and polished to form an even and smooth surface. Finally, the exposed metal is electroplated with a thin film of gold to prevent corrosion and to give a pleasing appearance. During the early 1600s Japanese rule banned nationals from either going abroad or returning home if already out of the country. Similarly foreigners, including missionaries and traders, were expelled from the country and banned from entering, leaving the country in relative isolation for a century and a half. This was largely due to fear of military conquests by European powers, along with the fear that outside ideas might upset social order and cultural traditions. This period, although isolating, allowed for an exploration of identity and culture and lead to productivity and refinement of Japanese artistic, social and religious heritage. Early Japanese cloisonné catered to the wealthy merchant class and ruling samurai, and took the form of sword furniture, such as tsubas, and decorative objects. Cloisonné increasingly developed to include vessels and other items. In July 1853 the US Navy entered the bay at Edo, demanding that Japan resume trade with the West. Fifteen years later the shogun resigned, being replaced by the Emperor. In March 1876, during the Meiji period (1868-1912), the Hatôrei edict was passed, officially abolishing the samurai as a class and ending their privilege of carrying swords. This edict, along with the fact that Japan had recently opened to Western trade, marked a decline in the demand for cloisonné within Japan, with Japanese goods being replaced by those of European or American manufacture. Japan, however, held tremendous fascination to Western countries. Promotion of Japanese cloisonné and other items at international exhibitions such as the 1867 Paris International Exposition led to the export of numerous products from Japan, thus providing an alternate marketplace for traditional artists. During this time the Museum endeavoured to build on its collection from this region, with major acquisitions coming from museum committee member Professor Archibald Liversidge in 1887 and from Father Julian Tenison-Woods (1832-1889), a geologist and spiritual adviser of the Blessed Mary MacKillop, in 1889-90. Unlike Liversidge, who collected with an intellectual eye, Woods' collection is exotica, souvenirs of 'celestial' difference from European standards.